Round glass ornament with an EGA Shop Exclusive design, featuring a patriotic design with the text "Proud of My Marine". Comes with gold ribbon for hanging on a Christmas tree. The lights from your Christmas tree shining through this ornament give it a whimsical glow. 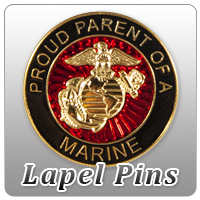 Makes a great holiday gift for yourself and each member of the family to show their support of their Marine.